I am really excited to share my baby girl nursery with you guys today. Since I have three little girls, finding the right girl room decor can be a bit of a challenge. With my daughter’s nursery I wanted it to be colorful and fun and I also wanted it to have character and be special to her. This is a sponsored conversation written by me on behalf of Shutterfly. The opinions and words are all mine. 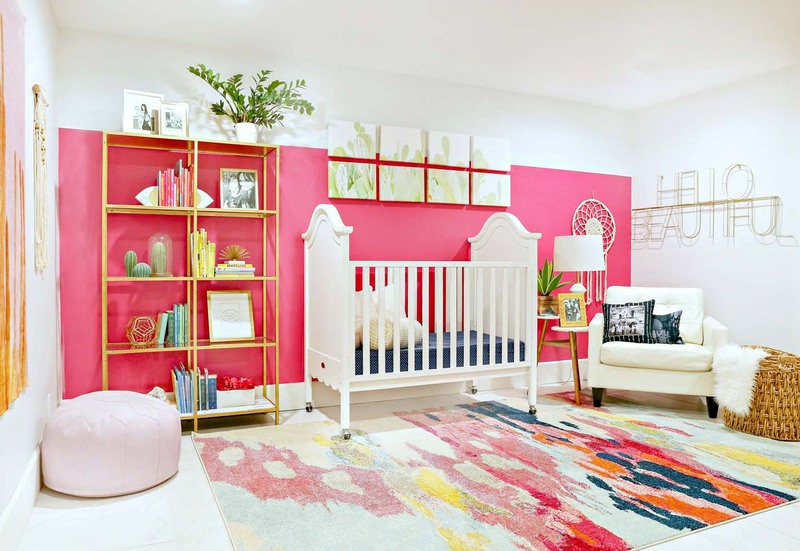 Designing a nursery or any room for that matter can be challenging. There are so many amazing and beautiful nurseries and rooms for inspiration. Today I want to show you how and why I decorated this nursery the way I did. I want to walk you through the different steps I go through when deciding on the decor of any room in my house. In this room I did not want to have too much of a nursery theme but at the same time I did want to have some kind of theme without having it be too over the top in your face screaming “Nursery Theme.” As I was planning out the nursery decor I kept going back to cactus and desert vibe and I wanted to put that into the nursery somehow. I am also loving the bohemian vibe that I am seeing a lot right now in home design. 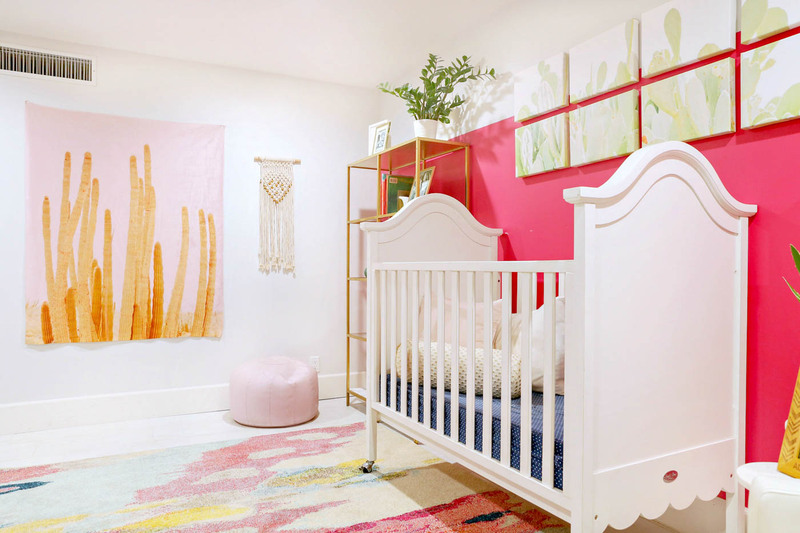 When I was really defining my “nursery theme” I decided that I wanted a colorful bohemian vibe with a bit of an Arizona style twist. When most people think about baby girl nursery color schemes they think of light pink, light purple and more of a pastel color palette. 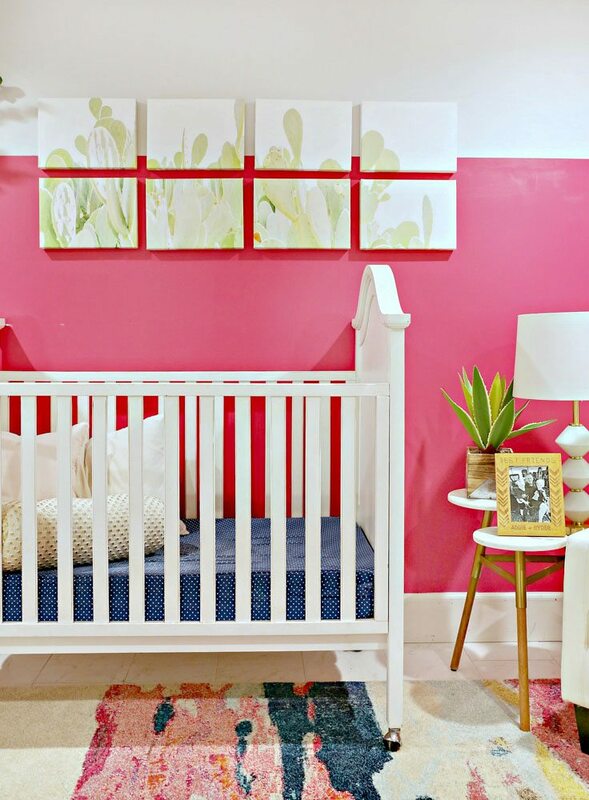 In this nursery I wanted a bit more color and more fun than just the soft color schemes. When I found this rug I fell in love with it. I pulled the colors from this rug for the color scheme for the baby girl nursery. How do you come up with a color scheme for a room? You find something like a fabric, artwork, or like I did for this space a rug that you love and that you want to be in the space, then you pull the colors from that item and go from there. When it comes to baby girl nursery decor I like to make it personal. Whenever we have designed any kids rooms we have always made an effort to make it personal to the child. We love to have decor that the kids love and that means something to them. Like when Mallory’s little boys were big into superheroes she designed their room with a superhero themed room. I wanted my baby girl nursery to have pictures of our family everywhere. I had some family pictures that we have recently taken and instead of just having them in picture frames on the wall I added them to this cute Shibori Stripe 18×18 pillow and now it’s one of my daughters favorite things. She wants to sleep with it every single night and I love that she can snuggle pictures of our family together. As an accent pillow I also added this cute 12×16 monogram Shibori Pillow. On the Shutterfly website I also found this darling Best Friends Wood Frame and I just loved it. I love that it is personalized and that it fits in perfectly with the nursery decor. I fell in love with two different cactus prints. They are both from Brittney Gurr Prints and she has a bunch of different desert prints and artwork. 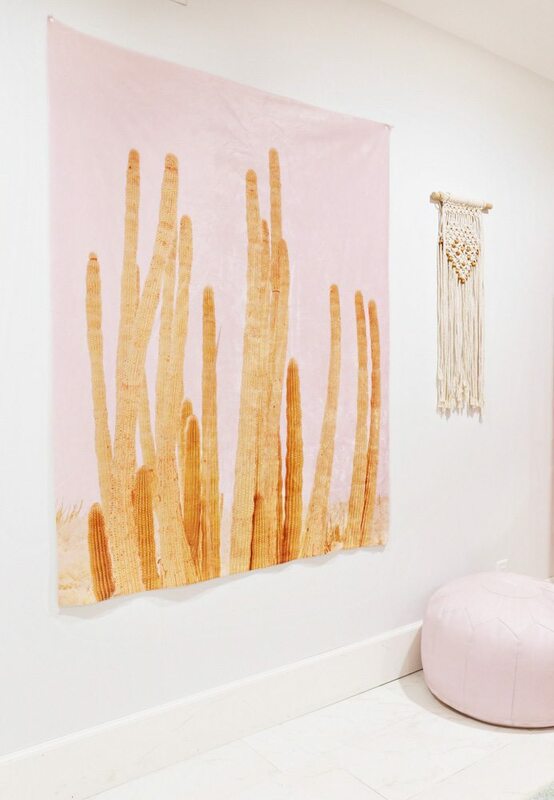 I loved the Prickly Pear and Pinkie Cactus Print and I really wanted them to be in this nursery but I also did not want them to just be framed on the wall even though that always looks so good. I have used Shutterfly for room decor in other projects and I love that I can upload any photos that I want and that they have so many different decor ideas for photos and artwork. I also love that with Shutterfly you can personalize a room and a space in a unique way. I wanted the main artwork in this room to be this cool Symmetrical Eight Spread Canvas Prints. It was so easy and simple to do, I just downloaded the Prickly Pear photo and then uploaded it to Shutterfly and they did all the work for me. I could even adjust which parts of the photo I wanted to show. It was so easy and makes a very big statement in this room. The best thing about this artwork gallery wall is that Shutterfly sends a hanging kit which makes this sure an easy install. It has a grid, a level and tells you exactly how to hang it up. I love that it is a very large piece of art and that it has a really cool and different way to display artwork. I love that this artwork comes in a few different options. I got the artwork done in a canvas but they also offer it with either a white or black frame. In this nursery I also had another wall where I could display a big statement artwork. Since this room has a bit of a bohemian vibe I loved the idea of some kind of tapestry. So I thought it would be cool to have the Pinkie Cactus print printed on a this 50×60 inch fleece photo blanket and I could use it in two different ways. I can use it as a throw blanket and also as large tapestry. I love the outcome. This blanket is great quality and it is super soft. 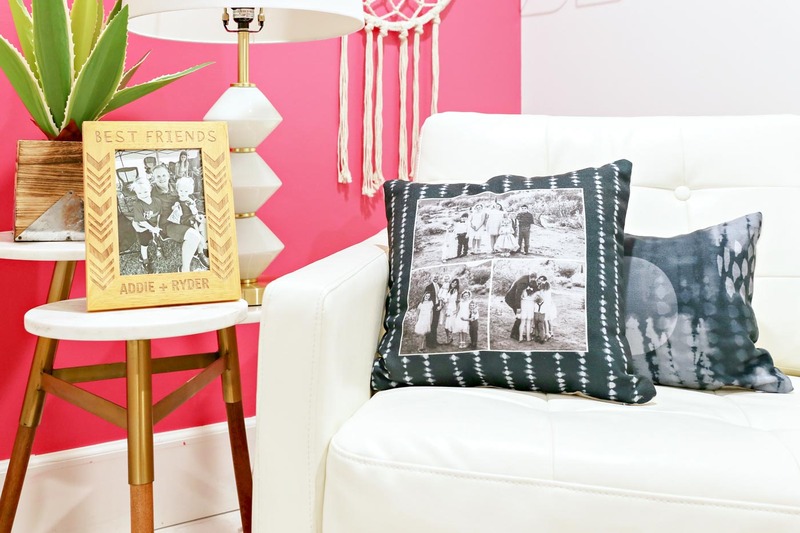 I love that there are so many different personalized pieces in this room and I love that Shutterfly offers so many different options and that it is so easy to add such a personal touch in every room in your house. Shutterfly also has amazing deals and discounts so be sure to check them out. Loving how my baby girl nursery has turned out. Hopefully with these few tips you can have a better idea of how to design a room in your house. Could you please tell me what color the paint is in your nursery? It’s very pretty! And also where you got the tripod table that has the lamp on it. Thank you so much it looks great!